Zyxel Cloud Intelligence receives unknown ﬁles from global ATP gateway's enquiries and stores all information with every new threat recognized, Zyxel Security Cloud becomes a continuously-growing and self-evolving security defense intelligence that learns, grows, and evolves at all times. Sandboxing isolates unknown files and identifies if they are new malware types that conventional static security mechanism cannot detect, ensuring network security against zero-day attacks. Cloud Threat Database syncs daily with all ATP devices so the machine learning beneﬁts on the cloud can reach out to every ATP. This makes the cloud and all devices a robust security ecosystem that learns together, grows stronger, and always stays immune to new unknown attacks. ATP Firewall is designed with multi-layer protection against multiple types of threats from in and out. Sandboxing, Malware Blocker, and Intrusion Prevention block external attacks while Application Security and Web Security empower you to restrict users' inappropriate application usage or web access, all together safeguarding your network without any unattended gaps. Application Security includes Application Patrol and Email Security features, not only does it block malicious attacks, but it also provides managerial control to optimize application traffic, or block undesired applications. Web Security includes Botnet Filter and Content Filter features, covering both URL and IP checking with cloud-synced categories that can evolve with the growing cloud database. ATP can restrict access from high-risk countries and can know the source or destination of attacks with GeoIP address translation for geographic mapping. The IDP (Intrusion Detection and Prevention) feature runs deep inspection to block exploits and attacks from vulnerable applications, ensuring uncompromised security. Anti-Malware feature is empowered by daily synchronization from Cloud Threat Database, ATP malware protection is lifted from a local scope to a comprehensive cloud level with global sharing synergy. Sandboxing contains all unknown files or user patterns in isolation, then emulates the programs to run and identifies whether or not they are malicious. If its malicious, Sandboxing will update this new malware information into Cloud Threat Database. SecuReporter sees, analyses, and reports network threats so you can be advised what security actions to take. It is a cloud service that turns logs into intelligence to deliver comprehensive reporting and analytics. *1. Actual performance may vary depending on network conditions and activated applications. *2. Maximum throughput based on RFC 2544 (1,518-byte UDP packets). *3. VPN throughput measured based on RFC 2544 (1,424-byte UDP packets). *4. AV and IDP throughput measured using the industry standard HTTP performance test (1,460-byte HTTP packets). Testing done with multiple flows. *6. After Gold Pack has expired, it will support only 2 APs. 24.5 dBA on < 25°C operating temperature, 41.5 dBA on full FAN speed. 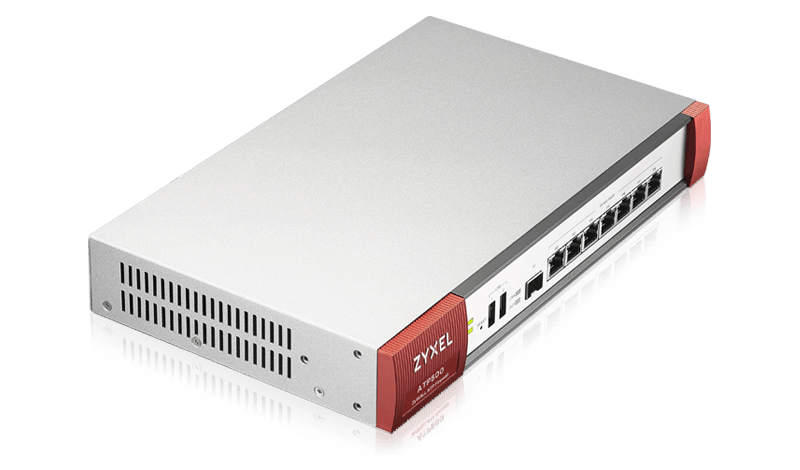 Download the Zyxel ATP500 Datasheet (PDF).